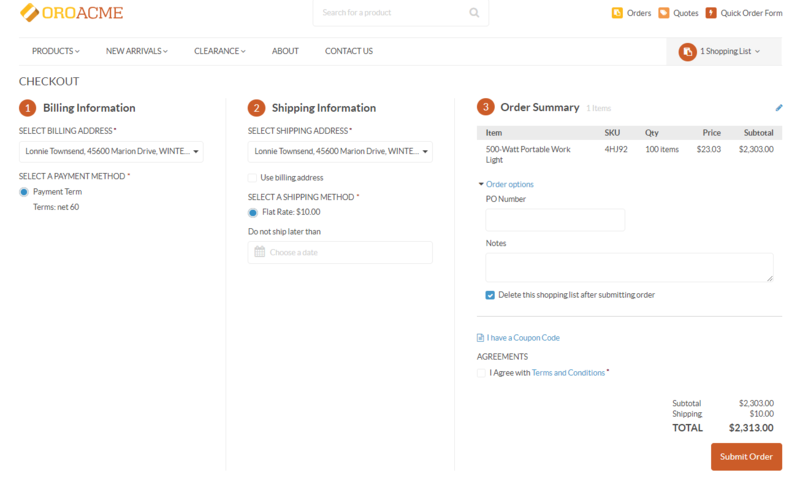 In your Oro application, you can control the way the checkout is displayed to customers in the storefront. By default, each checkout step is displayed on a new page. However, by activating the Single Page Checkout workflow in the management console, you can make all steps fit one page. This will make the checkout process easier and quicker for customers, since they will be able to see how far along in the checkout they are, and how many fields are left to complete it. Click Single Page Checkout to open the flow. If the workflow is active, you can deactivate it from the list page by clicking . Activate — Click Activate on the top right of the page to activate the workflow. Deactivate (if the workflow is active) – click Deactivate on the top right of the page to deactivate the workflow. For more information managing workflows, see the Workflow Management topic. Add an item to the shopping list in the storefront, and click Create Order to proceed to the checkout. In the Billing Information section, provide your address and select a payment method. Provide shipping and billing addresses. Set the Do Not Ship Later Than date. 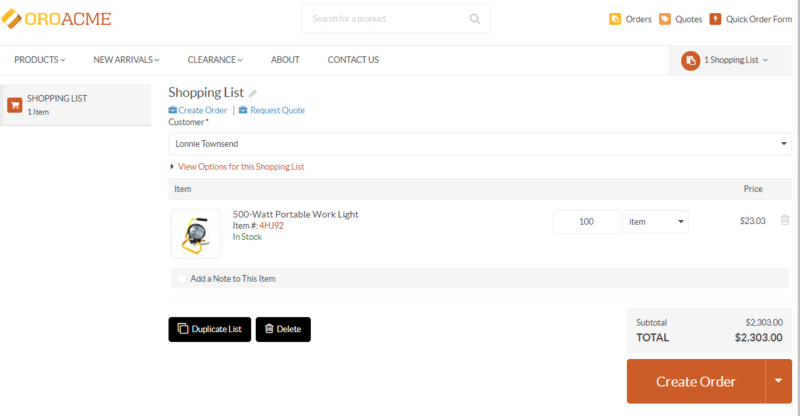 Review the order by checking items, SKUs, item quantity, price and the subtotal amount. Select whether the shopping list should be deleted after submitting the order, or saved. Accept all mandatory consents to process your personal data, if such consents have not been accepted previously. Keep in mind that if you leave the checkout after accepting a mandatory consent, this consent is considered accepted and can be revoked only through the profile management. Submit the order by clicking Submit Order on the top left of the page. Receive an email confirmation with order details.